Hi, I'm Jo Knox, and if you're looking for a great barbershop or hair salon, to get a great haircut, hairstyle or hair coloring treatment, along with an "up", fun atmosphere, then you're going to love my place. You want to feel great about yourself when you walk out of a barbershop or hair salon and that's what we make sure of before you leave our shop. You'll leave our shop with a haircut or hair style that's becoming to you and gives you confidence, knowing you look your best. I've been in Incline Village, doing hair, for over 33 years, and I'm only 39, (that made Cathy giggle) so you can be sure that we're not going anywhere. I love cutting and styling hair in Lake Tahoe. Give me a call at (775) 832-0293 for an appointment or just walk in. You can get a traditional barbershop style businessman's look, tapered hair cuts, white walls, fades, flat tops, crew cuts and butches. Women, you can have expert hair coloring. We also specialize in women's long, medium and short hair cuts as well as up-do's and comb outs. The kids will love our little kids' cuts. 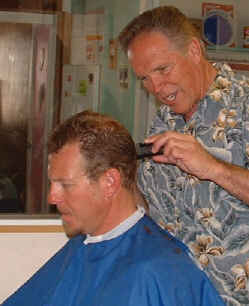 We're the best hair stylists in Incline Village Lake Tahoe. Nothing is more important to your sense of self confidence than a great looking hair style...and that's just what you'll get from the professional hair stylists at Jo Knox's Hair Design. Look for our sign out front. We've been in Incline Village for 33 years and we've got an excellent reputation with our clients, so you know you're going to get a great hair style from an experienced hair stylist. A good hair style begins with a good hair stylist and Jo, Cathy and Jessy all have been in the business for a decade or more doing all types of hairstyles and haircuts for men, women and children in a barbershop or hair salon setting.